So, you’re thinking about kayaking on rivers? From the Allagash in Maine to the Yellowstone in Montana, there are gorgeous rivers just waiting to be explored. Stay tuned for a guide on how to find your best river kayak, as well as our top 5 suggestions. What are the Types of Kayaks You Can Use on a River? There are 4 types of kayaks you can use on the river: recreational, touring, sea, and whitewater. All 3 are unique in their trip duration, required skill level, trip duration, and storage capacity. Read on to figure out which one fits your needs. Recreational: Recreational kayaks are built for use in slow-moving rivers. The calmer the better. Due to their low storage capacity, they are good to use on day trips of less than 10 hours. Anyone from beginner to intermediate will enjoy these kayaks. Touring: Touring kayaks were built to handle moving rivers and currents. They are best used by people of intermediate to advanced skill. 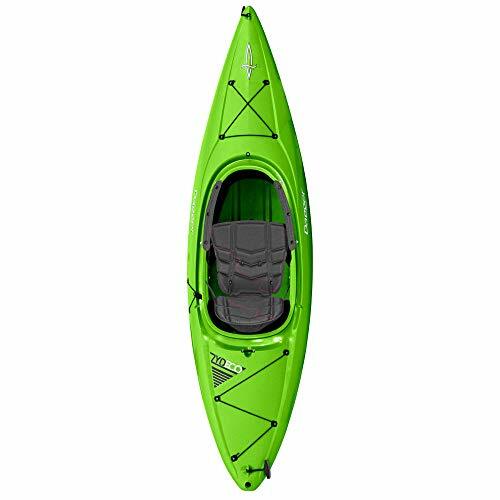 The storage capacity is moderate, and you can use these kayaks for both day and short weekend trips. Sea: The third type is the sea kayak. Aside from use in the ocean, they can also be used in moving rivers with rough currents. These are the best for longer trips and should be used by kayakers of intermediate to advanced skill. The storage capacity is high. Whitewater: The final kind is the whitewater kayak. These are best used on rapids and choppy water by intermediate to advanced kayakers. They are not good for touring due to their lack of tracking. There is a low to moderate amount of storage capacity. For more information, check out this video from Austin Kayak on the differences between kayak designs. What’s a Good Length and Width? The length and width of a river kayak are going to be different than crafts for other types of water. In fact, the dimensions of a river kayak matter more than most due to the many different conditions of water you will encounter. Length: Shorter kayaks are beneficial because they are easier to maneuver, lighter, and easier to transport. Longer kayaks are great because they are more stable, hold more storage, and are easier to paddle. We recommend nothing longer than 13 feet. Width: For use on the river, you will want a wider kayak. This ensures greater stability, generally enough to stand if you plan on fishing! Besides, the wider the craft, the better it does in strong currents. We recommend 30 inches plus as long as it is easy to paddle. Why are the Best River Kayaks Sit-Inside? Temperature: Many rivers are quite cold, especially in the mountains! Sit-inside kayaks are good for staying dry and warm. Even better, they come with nylon spray skirts to protect you from splash. Stability: The lower center of gravity created by sitting down inside the kayak increases stability. The cockpit allows you to brace yourself and even makes it comfortable with thigh pads. This helps you navigate through rougher river waters. Faster Movement: Sit-inside kayaks are generally faster than sit-on-top kayaks. They are made to cut through the water much faster and easier than their elevated counterparts. Look for a v hull to get the fastest movement. Long Distance Travel: Kayakers wanting to make a weekend or longer trip down the river should prioritize sit-inside kayaks. They typically feature enough storage areas for long-distance travel and can handle a wide variety of water conditions. At the same time, rivers produce unique hazards that every kayaker needs to become familiar with before setting out! The best shape for the bottom of the kayak, known as the keel, is rounded. The more rounded the keel, the greater the arch on the bottom of the craft. This is good for choppy waters, and secondary stability. A rounded keel may be difficult to get used to. However, it will pivot faster than a flattened hull. Tracking is better when the bottom of the kayak is flat, but on the river that is not our first priority. Here’s an expert look at different hull designs. When deciding on the best river kayak for you, think about the weight capacity. Remember you will need to consider the weight of your gear as well as your own bodyweight. Maybe even that of a dog or a child! How long do you plan to be on the river? Do you plan to camp and/or fish? If so, you will need more storage capacity. Look for a dry place to store your necessities, and gear tie-downs such as bungees. Longer kayaks offer more storage. The Sun Dolphin Aruba SS 12-Foot Kayak is a sin-inside craft for river use. It comes in blue, lime, and red so it is easily spottable. For extra storage, there is a portable accessory carrier included. There is also a removable rear compartment and open front with lots of legroom. This Aruba is made of Fortiflex high-density polyethylene that has UV-resistant properties. If you want to use this sit-inside for fishing, there are flush mount rod holders. Considering how long it is, the weight is next to nothing at 48 pounds. This Sun Dolphin tracks smoothly and is extremely maneuverable. On rivers, this Aruba SS turns on a dime! However, there is no skeg. That’s fine since this kayak is wider and moves a bit slower. The SS means there is extra storage. Unfortunately, it does not come with a paddle. 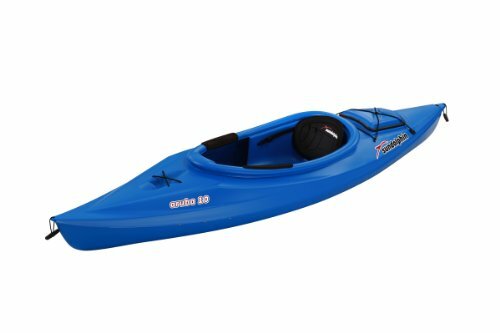 If you want to use your kayak to move quickly in flat and slow-moving rivers, the Dagger Kayaks Zydeco 9-Foot Kayak may be right for you! At only 9 feet and 36.5 pounds, this craft is extremely lightweight. Carrying and topping are next to nothing with the Zydeco. Rivers can have narrow, winding sections. This is where the Zydeco really shines! The short length allows for greater maneuverability in tighter environments. It is only 28 inches wide, but for its purpose this slightly more narrow kayak still offers stability. The smaller length lends itself to easier tracking, but the weight limit with gear is 220 pounds. Additionally, there is ample room for storage In front and behind the seat. In terms of the cockpit, you do sit inside but it is wide enough so you don’t feel claustrophobic. 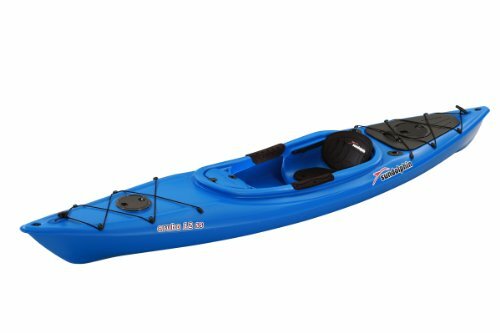 The sit-inside Sun Dolphin Aruba 10-Foot Kayak is great for beginner river kayakers. Since it is shorter, it is easier to maneuver. This Aruba comes in 7 different colors, so you are sure to find one that fits your style. The cockpit is large enough for a bigger person to fit into easily. The Aruba 10 comes with thigh pads, adjustable foot braces, water bottle holder, paddle holder, and shock cord deck rigging for extra storage. This Sun Dolphin is made of the same high-density, UV-resistant polyethylene as the Aruba SS. It even includes a spray collar. For your comfort, the Aruba 10 has an adjustable seat with high back support. There are also carrying handles to help you take the 40-pound kayak to and from your vehicle. The width is 30 inches, which is the perfect size for stability on the river. The Old Town Canoes and Kayaks Vapor 10-Foot Kayak is of the recreational variety. That means you should only take this craft onto slow-moving rivers and other calm water. Made of single-layer polyethylene, it is durable and can be easily repaired. For your convenience, the stern day well keeps your necessities within easy reach. For your comfort, there are thigh and knee pads along with adjustable foot braces. The seats are padded and flex for different sized kayakers. Paddle rests are included for hands-off rest periods. The width of the Vapor is 28.5 inches, and the cockpit is 19.5 by 48 inches. That makes it easy for anyone to get in and out. The whole thing weighs only 47 pounds and can hold anyone up to 325 pounds. Just remember to consider your gear weight before buying! The Perception Kayak Pescador Pro comes in both a 10-foot and 12-foot version. Each is available in 3 trendy color combinations: sonic camo, red tiger, and moss camo. If you are a fisher-person, there is even a special location for tackle box storage! Of the 5 best river kayaks, the Pescador Pro has the most comfortable seating. Perception created a pro seat that uses a recessed track to adjust. It also moves into 2 different positions: reclining and upright. Even the foot braces are adjustable to fit almost anyone of any size. The Pescador Pro has dual molded rod holders, a paddle park, and a molded cup holder. 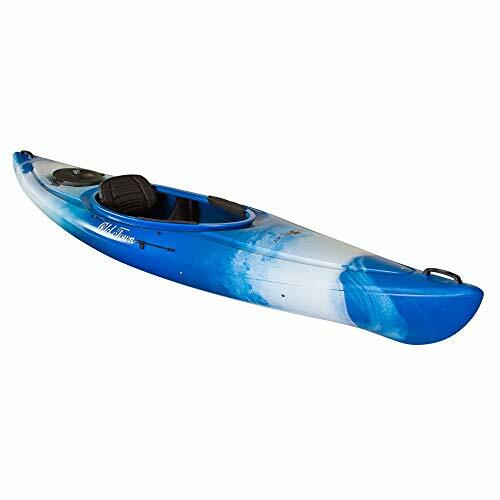 The whole kayak is made of durable polyethylene to protect you from river hazards. At 32 inches wide, this Perception Kayak is the perfect size for staying stable in moving water.